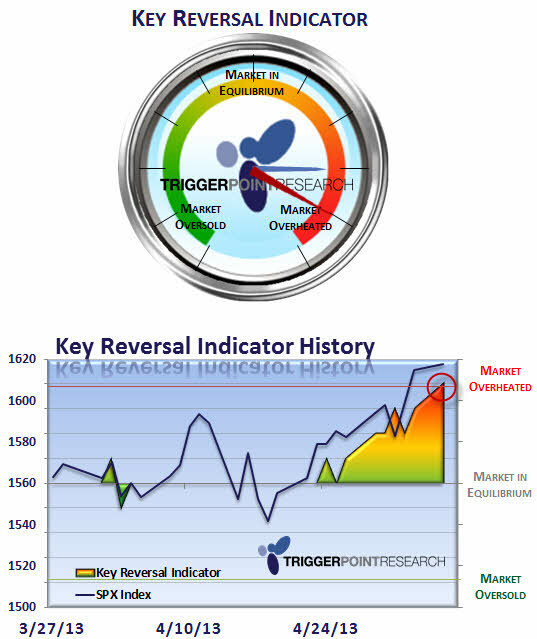 We wrote about the levels on the Key Reversal Indicator earlier today and now have an update as the level increased with today’s market action to a 4. This is the area where we will often see a turn in trend to relieve the excess buying or selling pressure. When it reaches a 5 this particular indicator that we have created often is calling for a rather swift and deep reversal. The current level is to be viewed as a warning that there is an overheated condition that is being measured. This will be a good test of the potential ability and use of this indicator as a predictive tool.